As we further rely on technology and become more isolated, who do we turn to when we need fixing? More pertinently, where do we turn for issues we cannot fix as easily – such as sadness or loneliness? 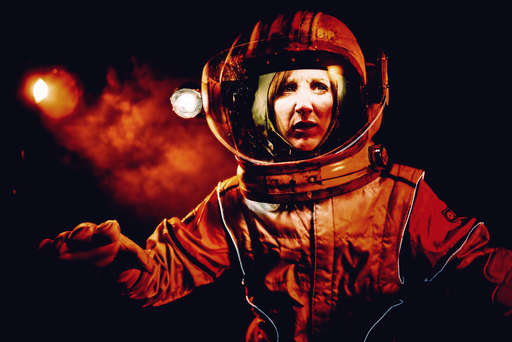 Directed by Emma Williams, this co-production between Green Ginger and Nordland Visual Theatre offers a look into a not-too-distant future; microscopic campervans housing shrunken humans who keep the body clean and running – the Intronauts. A sore throat? Simply ask and it's taken care of. What about an itchy arse? Same, but a less pleasant request. How about an upset brain though? Loneliness? Perhaps not so easily fixed. As our internal miniaturised cleaner ventures around the body of their thirty-year-old host, she shares similar dissatisfactions of emptiness. To her the exquisiteness of the body is mundane. For the audience, however, the blood cells, neurons and workings of the body are captured in reverence. Now in 2019, describing something as being 'a bit Black Mirror' has officially entered into cliché, but while Intronauts may feel similar to Charlie Brooker’s 21st-century marvel it only shares some slight nods. It certainly has similar technological warnings, yet its inspiration is clearly from 1960s sci-fi movies, gaming and even the odd BBC kids’ show (does anyone else remember Button Moon?). A multitude of mediums are used to tell the story of Intronauts, with none of them tedious or used purely for aesthetic. The show ranges from small-scale puppetry to convey the proportion of the body, to a more cinematic usage for the home computers or machine hubs. Green Ginger do need to take a look at their pacing, as this is the only area where the production is let down. Certain segments such as a dance scene in the Brain Bar, begin amusingly enough with highly impressive moves, but after a few minutes wear out their welcome. One particular scene which blends all of the show's elements perfectly is towards the end, as a sphere of cabinets – each one bursting open with memories conveyed through audio effects – are each presented with enough time to allow their gravitas to weigh on us. For the size of the production and its company, Intronauts is ambitious and designed methodically, the visual effects held to the same standard as the mechanical set pieces. It manages to put a simple, yet effective narrative forward cleanly – with only the smallest of issues.